Today our good friend John Conn delivered a tree to us that we had recently purchased. It happened by chance that he would be at the nursery where the tree was and he was kind enough to offer to bring it with him upon his return. Just today the tree was dropped off and we got our first chance to see it in person. A delightful tree with great potential! A small cell phone picture taken of the tree by me. Vic took some much better images with the big guns but I wanted to share this early image with you all. No work as of yet, but soon. 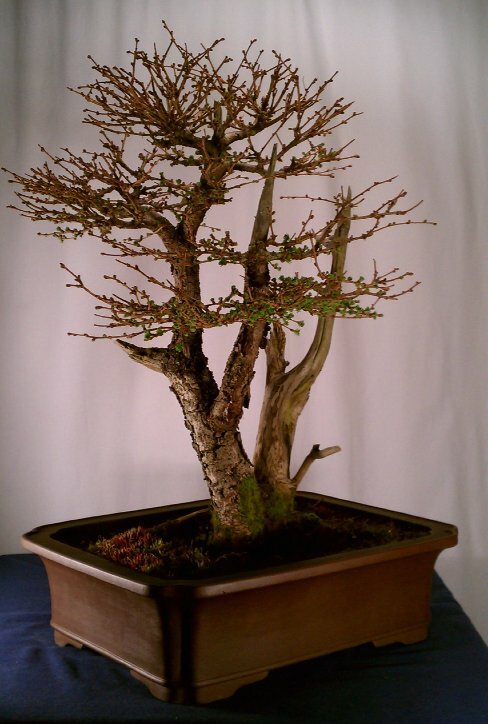 This entry was posted in Bonsai, Design, Photography, Progression and tagged bonsai, deadwood, focal point bonsai, gnarly, larch, Larix, progression by ang3lfir3. Bookmark the permalink. Just look at those buds popping. Nice catch! lol, yeah I was surprised by the pot also! I guess since it was not being shipped in the mail the pot was included which was a very generous touch. WeeTree is a great place and Diane is simply a wonderful person. Thank you once again Judy for bringing this little guy to my attention. I would have totally missed out if it weren’t for you! I agree Diane and Wee tree Rock!